You should always stand back and watch an aviary or a cage and observe what is going on inside. A healthy bird will be hopping from perch to perch, will look alert and usually display a natural shyness when confronted by a stranger standing near the cage. 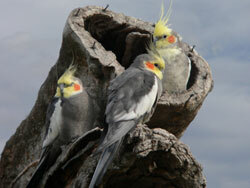 The cockatiels breathing should be even and quite, having an open beak or heavy and distressed breathing are signs of a respiratory disease. This could also been shown by having a creamy / watery discharge around the eyes and nostrils of the bird. Healthy birds feathers are smooth and shiny, the feathers should not show any kind of defects. Around the cockatiels vent, the feathers should be dry and clean, dirty feathers around the vent can be a sign of intestinal or kidney problems. Check out the droppings of the cockatiel, they should be green and firm with a white top, this is the natural material that is excreted from the kidneys. When looking to buy a cockatiel, you should dismiss the bird if it is underweight, has damaged feathers, any nasal discharge, crusty skin, an overgrown beak, missing toes, a dirty beak, or if it�s breathing looks impaired.